Dedicated horror fans may well know the name of Syrian born producer-director Moustapha Akkad from his front-of-film credit on John Carpenter's Halloween, but by then he had already made his mark with the 1977 historical epic The Message, which he followed in 1981 with the large scale biographical drama Lion of the Desert, which lost a fortune at the box office and was famed as one of the biggest financial disasters of film history. Interesting, huh? It is the 7th Century in Mecca, and powerful leaders are in conflict with Mohammad who attacks their way of life and the injustices it produces. Claiming to have seen a vision of the Angel Gabriel, Mohammad calls on the people of Mecca to cast aside the 300 idols of the Kaaba and to worship one God. Despite bitter opposition from the leaders of Mecca, Mohammad and his faithful followers meet secretly to listen to the revelations of the word of God. The leaders respond with persecution, forcing the Moslems to leave Mecca and take sanctuary in Medina. 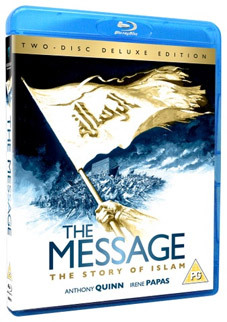 Described by DVD Verdict as "a mesmerizing experience... one of the most respectful and insightful looks into the origins of Islam ever," The Message will be released on UK DVD and Blu-ray on 2nd July 2012 by Anchor Bay at the RRP of £9.99 for the DVD and £15.99 for a special two-disc Blu-ray edition that includes the Arabic version of main feature in standard definition. The year is 1929 and Italian dictator Benito Mussolini faces a 20-year-long war waged by Bedouin patriots who are resisting Italian colonisation and the establishment of "The Fourth Shore" – essentially a re-birth of a Roman Empire in Africa. Hoping to crush the rebellion, Mussolini appoints the ruthless General Rodolfo Graziani, a man who would come to be known as the "Butcher of Fezzan". Leading the resistance is Omar Mukhtar, a teacher by profession but a guerrilla by obligation, one who has committed himself to fighting a bloody war than he knows cannot be won in his lifetime. As tanks and airplanes are deployed in the desert for the first time, the Bedouin realize their primitive weaponry is no match for the might of the Italian Army. But, driven by courage and inspired by their leader, they continue to fight on. Famously bankrolled by one Muammar Gaddafi to the tune of $35 million (which was a huge budget for any movie back in 1981), it made only $1 million back at the box office, despite a cast that includes Anthony Quinn, Oliver Reed, Rod Steiger (as Benito Mussolini), John Gielgud and Andrew Keir, cinematographer Jack Hildyard (Hobson's Choice, Topaz, The Message). 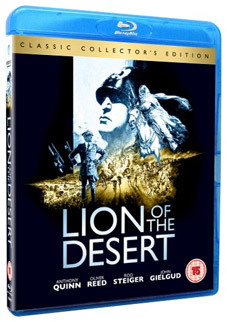 Lion of the Desert will be released on UK DVD and Blu-ray on 2nd July 2012 by Anchor Bay at the RRP of £9.99 for the DVD and £15.99 for the Blu-ray.